Mauri and I were friends in high school back in the ’60s, sang together, traveled together with a Youth for Christ Teen Team, but then went our separate ways in life. Mauri married Margaret-Rose, I married Paul, we both added three children to our families. The Macys moved a lot but stayed on the west side of the country; we Carlsons moved a lot but stayed on the east side of the country. During these years our families stayed in touch through Christmas letters/pictures. Little did we know these annual connections would carry the news that cancer would take both of our spouses—Mauri’s in 1988 and mine in 1993. Through several trips between Michigan and Oregon and a relatively short fax courtship, we moved into marriage with a clear understanding that life is precious and not to be taken for granted. Our six children offered their blessing and over time have come to love each other and embrace our blended family, which now includes their spouses and grandchildren. We’ve had our share of grief, as all families experience, most recently in the loss of our daughter Rachel in June 2015 from cancer at about the same age that cancer took her mother’s life. We’ve had surgeries to repair our aging bodies, yet consider ourselves healthy enough to still enjoy life. 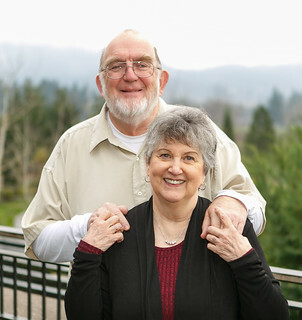 Mauri retired in 2014 from his long-held role as pastor of worship ministries in our church here in Newberg, Oregon. I had downsized my hours in the church office as a segue to retirement but in July 2017 returned to full time, adding church administrator to my job description. Due to theological differences, all the pastors and many of the congregation left the church. My 14 years of experience made me the best candidate to pull together and organize the many fragments to pass along to a new pastor when the time comes. Mauri still has a lot of music in him and uses his home studio to create arrangements and record demos (see the music page). He remains faithful to his longtime interests of coffee roasting, meat smoking, biking, watching sports, and spoiling his dog, Mr. Darcy. I spend more hours than I care to admit playing with photographs, digitized and stored in my computer. I use them for projects that record family history or just for my own entertainment, such as matching similar poses or collecting a series of the same theme or individuals. I love Facebook because it allows me to be an introvert and a social butterfly at the same time. Rachel and her husband and son moved to Newberg just before her death, which means all of our Macy children/grandchildren now live locally. Our Carlson children/grandchildren live in Arizona, Michigan, and Virginia, so I (and sometimes we) fly away from time to time to be part of their lives. Finally, in all parts of our lives we wholeheartedly acknowledge and value the presence of Christ, whose love we return in the form of worship and submission. Just spent about 40 min reading some of your stuff. I love your family. Greetings from Orpington (near London )England! I was so interested to read a bit about you via the YFC Alumni email today. Then I went to your website – and here is my response. As a young man of 20, I started fulltime christian service (as we used to call it!) on my birthday, 1st January 1961. I was the first fulltimer in a British YFC local “rally” – and stayed with South East London YFC for 12 years – then moved over to the ministry of Pocket Testament League for a further 30 years. Sadly PTL UK had to lose staff (lack of finance) and I was the “chosen one” – but carried on in various roles till I officially retired last summer – at 68. We are still very busy in all manner of activities and service -including helping our 3 married children with their 8 kids. What fun we have! It was fun to read about your weekend experiences. How surprised I was to see you mention Hadassah! Thanks for coming to the show! It can be really interested,then copye your content articles with out authorization, really embarrassed!If convey troubled to you,please email me,I will delete it right away. I am very interested in the photo from Gem City Stove Company. Do you know roughly what year this was taken? And was this from the Gem City Stove Company in Ohio? Or the one in Illinois? Thank you! Count us as two of your 17000 faithful readers!